University of Guadalajara Centro Universitario de la Costa (CUCosta) in Puerto Vallarta and the company AMResorts, a service provider for sales, marketing, and management of successful brands such as Dreams Resorts & Spas luxury hotels, established a strategic alliance to contribute to sustainable tourism development in Puerto Vallarta and the Banderas Bay region. 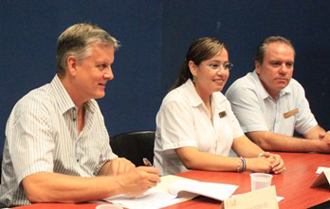 Dr. Max Greig, rector of the University campus, reported that through this agreement will be offered counseling and vocational guidance to the staff of Dreams Villa Magna of Dreams Puerto Vallarta and Riviera Nayarit hotels. Agreed commitments also include joint work on research by academics, researchers and students of graduate school, thereby contributing to the general purposes of the agreement, as well as the development of regional cultural dissemination actions. The signing of this agreement was carried out in the facilities of the Mini Auditorium Edulab, attended by Alma Gomez and Yann Leguillo, General Managers of the Dreams Villa Magna and Dreams Puerto Vallarta hotels, respectively. In this regard, Yann Leguillo said that through this agreement the Dreams hotels seek to contribute with the care of the Puerto Vallarta environment for the benefit of the regional tourism industry, establishing feedback links with researchers and participating in institutional programs of the University of Guadalajara. For its part, Claudia Lopez, Manager of the Dreams Villa Magna Hotel Human Resources, shared her comments in relation to the expectations of this agreement: "We are looking for people to know how important biodiversity (of the Bay) and become aware of the national and international importance to preserve it. In this sense, this alliance is our first formal experience and has unimaginable scope with activities for the environment and benefit of our employees, but we want to expand the spectrum of the entire local community."